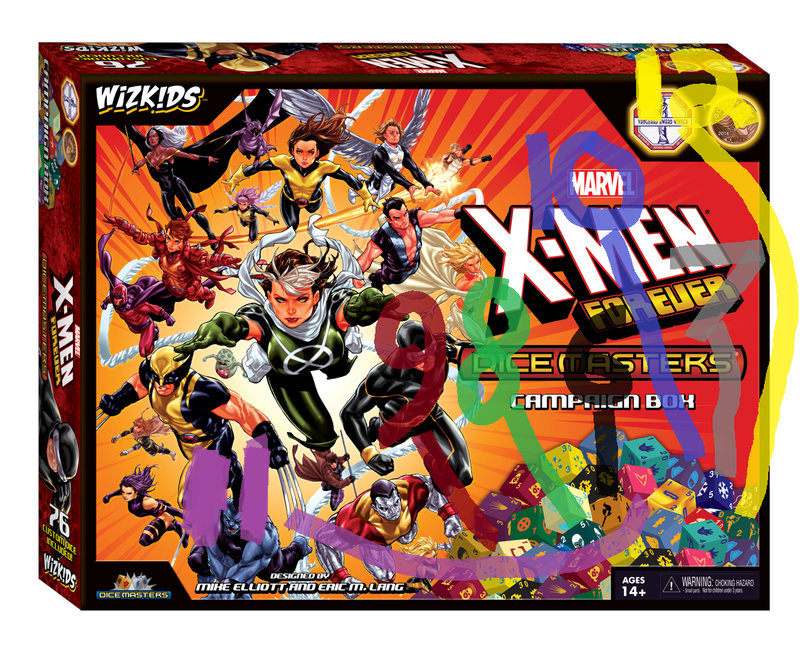 After doing an analysis of Justice yesterday, I figured I’d take a look at another upcoming set, X-men Forever, as well as its team packs. As with Justice, I am not analyzing the meta value of these cards; rather, I’m looking at the spoilers to find any hints as to what was not revealed yet. While we do not have nearly as many cards spoiled from this set as with Justice, there is still some interesting data to be found here. Before I begin, as I did yesterday, I would like to give a shout-out to two sources I will rely on throughout this article. The first is DMArmada. He recently made a fantastic video outlining all of the known (and a couple of new) spoilers from the X-men Forever Campaign Box and related team packs. You can check out his video here. The second is the Dice Coalition. They’ve been providing us with some breaking news about this set from Worlds, and they’re one of my go-to sources of information on Dice Masters. You can check them out at dicecoalition.com for tons of awesome Dice Masters content (including their awesome team builder, which we regularly use in our articles). Let’s begin by looking at the campaign box. At the back of the box, it states that it includes “62 Character Cards”. Right off the bat, we can tell that no matter the number of characters, we will not get 3 cards per character; 62 does not evenly divide by 3. 30: Kitty Pryde – More Human Than You! As a side-note: while I don’t focus on the BACs for this, I’d be remiss not to mention that one of the BACs shown on the back of the box (the one that’s right-side up) is a reprint of Teamwork, a classic BAC previously only available in an OP kit. This is a needed reprint for sure; thanks, Wizkids! Note that there is a die that looks like the old Phoenix die from AVX (11). While it’s not certain, I believe that this is the die for Hope Summers. I would not assume that Phoenix is in this set as of yet. As for the new green die (12), I believe this to be Cerebra’s die. I originally thought that it was Storm, but the back of the box shows that her die for this set is a recolored version of her die from XFC and DP. This means that we have at least 23 different characters in this set. Yes, seriously. Now, even though we have only seen a few cards from the set, we can still tell, from the card numbering, where some characters may only have 2 cards. Between Blob (7) and Kitty Pryde (30), we know of 8 different characters, with only 22 cards. This is two cards short of what is needed for 3 cards per character. This means that at least two of the following characters will only have two cards: Cerebra; Cyclops; Donald Pierce; Emma Frost; Hope Summers; Iceman; Jean Grey; Jubilee. We also know that there are only 17 character cards after Mystique’s last card (from 46 to 62). However, there are 6 different characters, so we’re one card short of the amount needed to have three cards per character. We thus know that at least one of the following characters will only have two cards: Professor X; Sabretooth; Sebastian Shaw; Sentinel; Storm; Wolverine. Now, there are a couple of other points I want to draw your attention to. First of all, as with Justice, we will only have 48 character dice in a box. With at least 23 characters, that’s an average of barely more than 2 dice per character (with all characters shown so far being “Max: 4”). I would plan, as with Justice, for the possibility that buying two copies of each campaign box will be far more important than with previous campaign boxes. Another point to keep in mind: somehow, this set has one less card than Justice, but while we know of 22 characters/non-basic actions for Justice, this set has at least 23 characters. Less cards but more characters? That doesn’t sound right. Do not be surprised if at least one more (as of yet unknown) character is shown in Justice. That’s all we know with respect to the Campaign Box. The team packs, however, have their own secrets to reveal. This team pack actually has a limited amount of information available. Cards from this team pack are labelled “of 24” with a dark “X” on the top right of each card. This leaves us with two characters with new dice who are unknown. 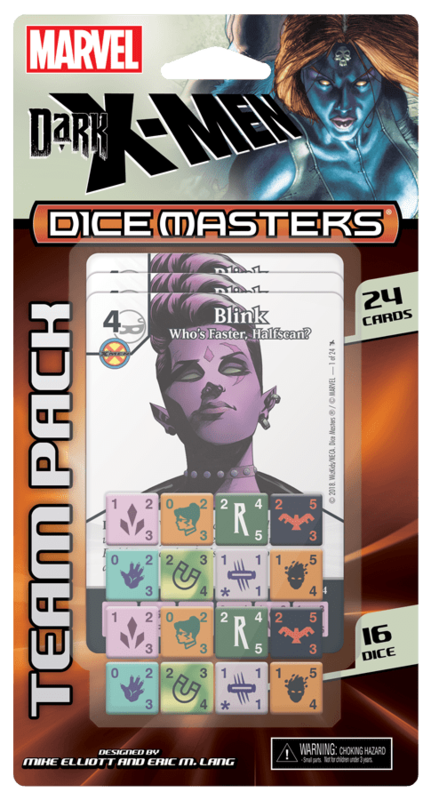 Looking at the card numbering, we can determine that Blink is, alphabetically, the first of eight characters in this team pack. Rogue, on the other hand, is fifth. What should be striking from the above isn’t so much who is in but rather, who isn’t. 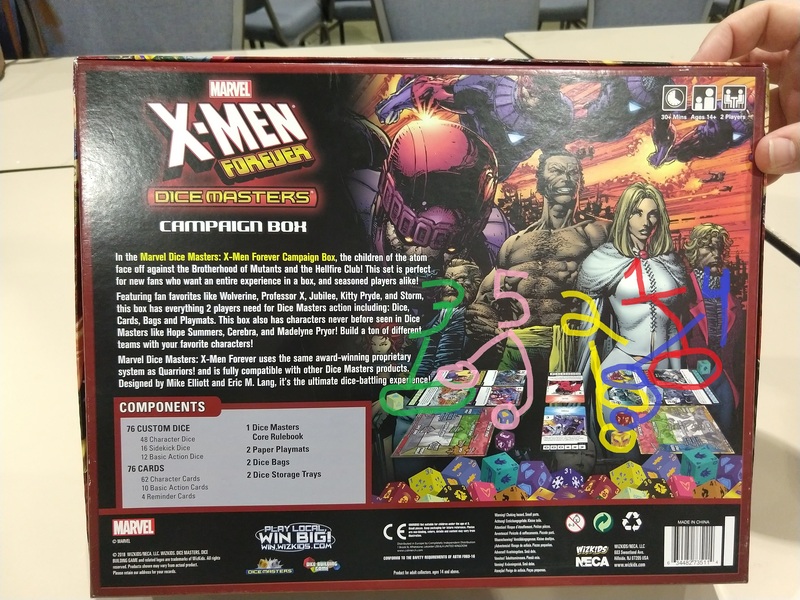 People speculated that the orange die with green font might be a new die for Mystique, but she doesn’t fit (plus, she’s already shown to be in the campaign box). This also makes it certain that Daken won’t be in this team pack. Both unknown characters’ names must be after Rogue’s. Looking at the orange and black die on the right, I’m thinking it might be Sunspot based on the logo (he’d make more sense in X-Force, mind you). I’m at a loss as to who the other missing character would be, though. I’m willing to listen to any suggestions. EDIT: In the comments, Reg suggested Sage/Tessa as the missing character. Now that he said it, I’m sure he’s right. Nice call, Reg! 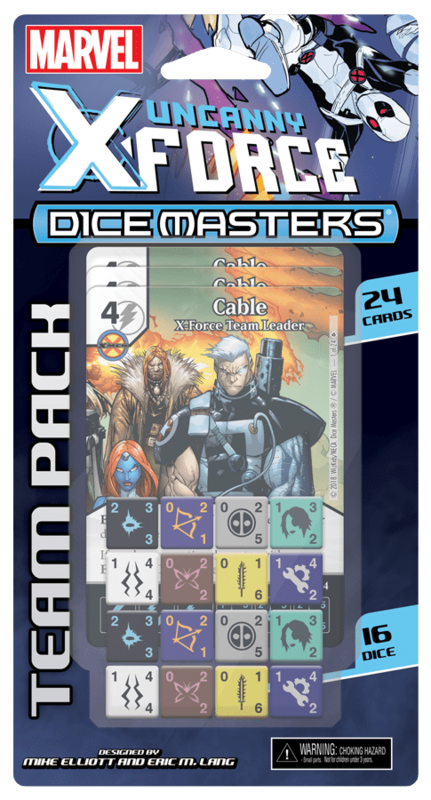 Cards from this team pack are identified as being “of 24” with a logo matching the one on Cable’s die at the top right of each card. 7: Deadpool – Roll Some Energy! This means that only one character is unknown. However, the card numbering gives us some good hints as to who it may be. The missing character must thus have a name that fits between Cable and Deadpool. X-Force has some characters that can fit here, like Cannonball, Caliban…However, I don’t think either of them is the missing character. Looking at the die for the missing character, we see a logo showing a bow and arrow. I thus believe this character is Dani Moonstar (aka Mirage), an X-Force member known to be an expert archer. This is speculation, of course, but it fits almost too perfectly. And there you have it. Thanks again for tuning in to this deep delve into the spoilers for X-men Forever. This is a set we won’t be seeing until March, but I’m definitely looking forward to seeing more information about it. There’s so much to look forward to (including those sweet black sidekick/BAC dice!). Again, if I missed anything, feel free to discuss it in the comments down below or over on Facebook. Let’s keep on rolling! EDIT: Made the pictures bigger for the old folks like me. – jourdo. In dark xmen i still think the missing dice is either sage or tessa. Fits in alphabetically with what is missing. Moonstar from the xforce. Daniel moonstar makes sense alphabetically. Thanks for the posts! We all looking forward to the new dice and really disappointing if they give us 2 dice… Hopefully some of them will have similar stats to previous so we can proxy locally and just borrow for competitive play. Good call on Sage! Seeing as she’s been involved with the Hellfire Club, she’d make so much sense in this (maybe a dual affiliation X-men/Hellfire Club?). The hairstyle fits the die too. I agree that 2 dice would be disappointing, but most of the dice are actually recolored versions of dice from XFC, UXM, or even DP, so you could proxy locally if your local crowd is comfortable with this. Don’t take the 2 dice thing as fact yet though; until we see the box, I’m still willing to be surprised. I just prefer to warn people so they can plan their purchases accordingly. Where to begin. It’s interesting to see that more than half of the characters on the box aren’t included in the game. I know art is art, and it’s very nice art [Mark Brooks, is it?]. Not that I’m clamouring for more Colossus [Colossi?] but a Pixie would have been great. So who do we have showing up for the first time? Lady Deathstrike, Hope, Rachel Summers Grey, Donald Pierce, Maddie Pryor, Mastermind, Cerebra. That’s not too bad, really. All of those have two dice in the set, maxing out at four, but luckily Rachel uses the Phoenix die and Cerebra uses the Sentinel die. So they can get some old dice thrown in to max them out, should you be so inclined. For weird numbers, Beast and Jubilee have three dice in the box, with a max of five. Magneto and Professor X have just one die in the box. Magneto is finally in his heroic white costume…even if he has been out of that outfit for a while now, and doesn’t have the X-Men affiliation. As for the Team packs. Looks like the original images up there are slightly wrong. Dark Beast uses the 021 122 132 AoU rather than the 012 023 124 AvX dice. Rogue also finds herself here rather than the main Campaign, despite being so prominent on the box. And the guess about Sage was correct. No Cannonball, despite Magik, Dani and Sunspot is pretty egregious. First of all, thanks for bringing this to my attention! I wrote this article based on the information we had in December. They seem to have brought the official webpage for the set online in the last few days. -I agree, the final roster does make the boxart look a bit silly, to be honest. I was hoping the Jubilee die was going to be Cannonball, personally, and I’m also disappointed to see him not making the cut here. -For dice numbers: looks like they’re doing exactly what they did in Justice. Sadly, looks like buying two boxes is needed for max dice. -The images in this article were taken straight from the Solicits page as it appeared at the time. It looks like they’ve just changed the images for these final versions. The change in Beast dice is pretty surprising, as I can’t recall any circumstance where they changed dice mid-development. However, it has the advantage of being much easier to distinguish from Beast’s. Of course, the comment about the images being wrong was more that they have now changed their mind, rather than you did anything wrong. You of course just posted what was provided at the time, so it’s not a judgement against you. I wonder if they intended to have Beast use those stats so that the “Nefarious Geneticist” Beast would match with those, but then changed their mind for whatever reason. It is curious. I had already planned to ‘reskin’ a Boom Boom Meltdown as Cannonball, since her dice is a close enough sort of look for Cannonball, and the card’s ability feels reasonable. His absence here means I’ll definitely be sorting that out. I understand the need to balance the must-have characters with the who-cares characters, but sometimes the logic behind some choices are strange. Then again, I’ve been collecting Heroclix for a lot lot longer than Dice Masters. So this sort of decision making shouldn’t surprise me. I’m still waiting on delivery of my Justice box and team packs, so I can’t get too excited for X-Men just yet.